Hydroxytyrosol (3, 4-dihydroxyphenylethanol; DOPET) is a phytochemical with antioxidant properties. After gallic acid, hydroxytyrosol is believed to be one of the most powerful antioxidants. Its oxygen radical absorbance capacity(ORAC) is 40,000 umolTE/g, which is ten times higher than that of green tea, four times higher than that of VC, and two times higher than that of CoQ10. In nature, hydroxytyrosol is found in olive oil in the form of its elenolic acid ester oleuropein and, especially after degradation, in its plain form. Both compounds, along with oleocanthal, are responsible for the bitter taste of extra virgin olive oil. The olives, leaves and olive pulp contain small amounts of hydroxytyrosol, most of which can be recovered to produce hydroxytyrosol extracts. Studies have shown that a low dose of hydroxytyrosol reduces the consequences of sidestream smoke-induced oxidative stress in rats. Hydroxytyrosol has been demonstrated to be a monoamine oxidase inhibitor (MAOI). It functions as a selective reversible inhibitor of monoamine oxidase A (RIMA). Hydroxytyrosol is a also metabolite of the neurotransmitter dopamine. The Olive (Olea europaea) is a species of a small tree in the family Oleaceae, native to the coastal areas of the eastern Mediterranean Basin, from Lebanon, Syria and the maritime parts of Turkey and northern Iran at the south end of the Caspian Sea. It is short and squat, and rarely exceeds 8–15 meters in height. The silvery green leaves are oblong in shape, measuring 4–10 cm long and 1–3 cm wide. The trunk is typically gnarled and twisted. While olive oil is well known for its flavor and health benefits, the leaf has been used medicinally in various times and places. Natural olive leaf and olive leaf extracts (OLE) are now marketed as anti-aging, immunostimulators, and even antibiotics. Clinical evidence has proven the blood pressure lowering effects of carefully extracted Olive Leaf Extracts. Bioassays support its antibacterial, antifungal, and anti-inflammatory effects at a laboratory level. 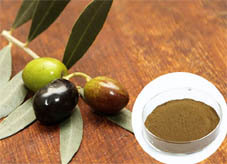 A liquid extract made directly from fresh olive leaves recently gained international attention when it was shown to have an antioxidant capacity almost double green tea extract and 400% higher than Vitamin C.
The primary medical constituents contained in unprocessed olive leaf is believed to be the antioxidant oleuropein and hydroxytyrosol, as well as several other polyphenols and flavonoids including Oleocanthal. Olive leaf extract is derived from the leaves of the olive tree. •Anti-virus, anti-bacteria, anti-fungi, and anti-protozoa and etc. •Prevent the hardening of the arteries.